Greetings from the Australian Computer Society's (ACS) head office in Sydney, at the launch of the report "Blockchain 2030: A Look at the Future of Blockchain in Australia". Speaking at the launch, ACS President, Yohan Ramasundara, likened blockchain to a fifth generation fighter being launched from the deck of an aircraft carrier into a turbulent sky. 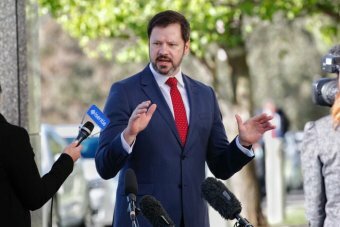 Ed Husic, Shadow Minister for the Digital Economy, was not wearing a green jacket (as those who launch carrier aircraft do), but launched the report. His main message was that we should not have to play catch-up on tech, such as blockchain. This is the second report on Blockchain, from ACS. The first report was by IP Australia, the second (today), is by CSIRO. There was much talk about "trust" at the launch. However, I suggest that blockchain is about doing business in the face of a lack of trust. Either you don't trust the people you are doing business with, or you don't trust the government, and the blockchain provides a way to work with this lack of trust. One interesting question for the panel was what would be the effect of quantum computing on blockchain. Australia is a leader in both technologies. Unfortunately the panel did not have a clear answer. ps: I am on the ACS Blockchain Committee. for Bitcoin, blockchain technology can be widely applied to improve business processes, increase transparency, and drive the creation of new jobs and industries. Over the last decade, blockchain technology has grown in popularity and use, and has already begun to disrupt existing markets in Australia and around the world. The opportunities blockchain presents have been invested in, studied, explored, and considered, in almost all sectors of the economy. Blockchain has attracted significant public and private investment, and introduced previously non-existent products and services across multiple industries.